Sorry to hear that the kids have been sick. That's always hard on mom! I've been reading your machine quilting tutorial. It's great, thanks! One question when you have a minute...you started in the middle at the top...doe you do small sections or move to the right, down and back left. I've been practicing on small pieces, but I'm a bit confused about how to proceed with something larger. Any advice would be appreciated. 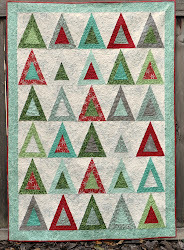 Jacquie, I answered your question in the machine quilting tutorial post. Hope it helps!